US Attorney General Eric Holder said Friday in Los Angeles that the federal government will enforce its marijuana laws in California even if voters there decide in November to legalize marijuana by approving Proposition 19, the tax and regulate marijuana legalization initiative. The comments came during a joint press conference with Prop 19 foes, including Los Angeles District Attorney Steve Cooley and Los Angeles County Sheriff Lee Baca, as well as former heads of the DEA and Immigration and Customs Enforcement. Cooley, who is running for state attorney general, has said he believes all medical marijuana dispensaries are illegal. According to the Associated Press, Holder Wednesday wrote a letter written to former heads of the DEA saying the Justice Department strongly opposes Prop 19 and remains committed to enforcing the Controlled Substances Act all across the country. "We will vigorously enforce the CSA against those individuals and organizations that possess, manufacture or distribute marijuana for recreational use, even if such activities are permitted under state law," Holder wrote. Legalizing marijuana would be a "significant impediment" to the federal government's effort to target drug traffickers and would "significantly undermine" safety in California communities, the attorney general said. Prop 19 would legalize the possession of up to an ounce of marijuana by adults over 21. It would also allow them to grow up to 25 square feet of marijuana and possess the resulting harvest. And it would allow cities and counties to permit, regulate, and tax commercial marijuana sales and cultivation. The Holder Justice Department last year said it would not interfere with medical marijuana in states where it is legal, but the department is apparently drawing the line at legalizing recreational use. Whether the DEA could actually arrest three million California pot smokers remains to be seen. Holder's Los Angeles press conference and release of the letter to former DEA heads did not go unchallenged. The Prop 19 campaign, the Marijuana Policy Project (MPP), and the Drug Policy Alliance all issued responses Friday morning. "As we saw with the repeal of alcohol prohibition, it takes action from the states to push the federal government to change its policies," said former San Jose police chief Joe McNamara on behalf of the campaign. "Passing Proposition 19 in California will undoubtedly kick start a national conversation about changing our country's obviously failed marijuana prohibition policies. If the federal government wants to keep fighting the nation’s failed 'war on marijuana' while were in the midst of a sagging economic recovery and two wars it just proves that the establishment politicians' priorities are wrongly focused on maintaining the status quo," he said. "As will be shown on November 2, Californians are not going to let politicians in Washington, DC tell them how to vote." "The truth is that the use of marijuana -- a substance far less harmful than alcohol or tobacco -- is widespread in this country and nothing the government can do will ever stop that," said Steve Fox, MPP's director of government relations. "The only question is how we structure the market for marijuana so that it is best for society. Will we have marijuana sold in licensed, tax-paying and regulated stores or will we continue to have it sold in a completely unregulated market that makes it more available to teens? Will we impose standards so that purchasers know the quality and purity of the marijuana they are buying or will we keep it in a far less safe unregulated market? Will we have the profits from the sale of marijuana go to legitimate taxpaying American business owners or will they go to underground dealers and cartels who will pay no taxes and defend their interests through violence?" Saying that Holder and law enforcement opponents of Prop 19 are motivated by "arrogance, prejudice, and self interest," Fox accused them of putting their own job security ahead of the health and safety of the American people. "Attorney General Holder is not looking out for the health and safety of the American people. He is nothing more than the lead advocate for a never-ending taxpayer-funded jobs program for law enforcement officials in this country. If you look at the opposition to marijuana policy reform in this country, it is driven almost entirely by people whose jobs are dependent on arresting and prosecuting individuals for marijuana-related offenses. The only other prominent group is elected officials who ignorantly turn a blind eye to alcohol-fueled violence in our communities in order to pretend they are 'tough on crime' by going after marijuana users who simply want to enjoy a substance less harmful than alcohol in peace." "The Attorney General’s posturing notwithstanding, this is 1996 all over again," said Steve Gutwillig, California director for the Drug Policy Alliance. "Naysayers said then that the passage of Proposition 215, California’s medical marijuana law, would be a symbolic gesture at most because the federal government would continue to criminalize all marijuana use. Today more than 80 million Americans live in 14 states and the District of Columbia that have functioning medical marijuana laws. All that happened without a single change in federal law," he noted. "The reality is that the federal government has neither the resources nor the political will to undertake sole -- or even primary -- enforcement responsibility for low level marijuana offenses in California. Well over 95% of all marijuana arrests in this country are made by state and local law enforcement. The federal government may criminalize marijuana, but it can’t force states to do so, and it can’t require states to enforce federal law," Gutwillig said. What amazes me about this isn't that Meg Whitman is as much of a drug war idiot as she is. There's nothing surprising about that, but it's just tragic that her Democratic opponent Jerry Brown has chosen to join her in opposing Prop 19. By taking a stand against marijuana reform, Brown has offended an enormous cross-section of young liberal voters whose support he desperately needs in this close race. If Brown genuinely has a problem with legalizing marijuana, that's one thing, but if he thinks he's scoring any political points with this position, he's out of his mind. As the above video shows, Whitman is accusing him of being "soft on crime" regardless of his anti-legalization stance. What more could she even say? Getting attacked by Whitman for supporting Prop 19 would actually help him. After all, marijuana legalization is doing better in the polls than either of these fools. Update: On a related note, what's up with Meg Whitman claiming that "every single law enforcement official in this entire state is against Proposition 19"? If she's followed the debate at all, she should know that Prop 19 has received a mountain of endorsements from law enforcement. This has been widely reported in the press, so she's either lying or just not paying attention. You may have read about me this week on StoptheDrugWar.org. My family and over 60 employees in California produce the best-selling natural brand of soap in the United States. Last week I made a personal $75,000 donation for a statewide "Yes We Cannabis" student fire truck tour of campuses throughout California, registering voters and getting people to the polls to pass Prop 19 and legalize cannabis this Election Day. You can read about why I decided to do this here. Register to Vote: Click here to print a form out that you or your friends can submit to your local election office. You have to register by the 18th to vote in California this year. Canvass: If you live in California, South Dakota, Arizona or Oregon, or can get to one of those states, click the state's link above to find out how to volunteer in person. I'm grateful to Richard Lee for putting Prop 19 on the ballot with $1.5 million of his own money, and I'm proud that I could do this for Prop 19 too. Now it's your turn: The time StoptheDrugWar.org members spend at home or a friend's home or a coffee shop with your cell phone, could literally be what makes legalization happen this year. So please sign up and volunteer today! P.S. Voter registration in California ends on Monday, a few days from now. So please don't wait -- please volunteer today! We believe that legalizing marijuana in California would effectively eliminate Mexican DTOs’ revenues from supplying Mexican-grown marijuana to the California market. As we elaborate in this chapter, even with taxes, legally produced marijuana would likely cost no more than would illegal marijuana from Mexico and would cost less than half as much per unit of THC (Kilmer, Caulkins, Pacula, et al., 2010). Thus, the needs of the California market would be supplied by the new legal industry. While, in theory, some DTO employees might choose to work in the legal marijuana industry, they would not be able to generate unusual profits, nor be able to draw on talents that are particular to a criminal organization. This is how the media describes a report stating that Prop 19 would "effectively eliminate" drug cartels' marijuana profits in California. It's yet another definitive example in the long history of media outlets missing the point by failing to actually read the marijuana research they're reporting on. This confusion couldn't have come at a worse time, although the timing is hardly coincidental. In a few short weeks, we'll find out whether coordinated attacks like these are enough to derail Prop 19, which has generally been polling well despite no shortage of rabid opposition from the usual prohibitionist peanut gallery of police, politicians, and the press. Despite this week's high-profile attempt to refute one of our lead talking points, it will be up to the voters to decide, and the measure's impact on drug trafficking is only one dimension of the issue among many. Moreover, it's also possible that increased focus on the drug trafficking issue could end up amplifying our argument in spite of the media spin. Only a few weeks remain, and one thing you can count on is the growing desperation of our opposition and the inevitable mindless appeals to fear and paranoia that they're certain to deploy. We are entering the late stages of the most significant marijuana legalization debate in modern history, and we'll soon learn what sort of malicious nonsense remains in their arsenal. Enemies of reform have always been known more for stubbornness than creativity, so I'm not expecting to hear anything new, but we'd be foolish not to expect their very worst. Mexican drug trafficking organizations make billions each year smuggling drugs into the United States, profiting enormously from the prohibitionist drug policies of the US government. Since Mexican president Felipe Calderon took office in December 2006 and called the armed forces into the fight against the so-called cartels, prohibition-related violence has killed more than 28,000 people, the government reported in August. The increasing militarization of the drug war and the arrest of dozens of high-profile drug traffickers have failed to stem the flow of drugs -- or the violence -- whatsoever. The Merida initiative, which provides $1.4 billion over three years for the US to assist the Mexican government with training, equipment and intelligence, has so far failed to make a difference. Here are a few of the latest developments in Mexico's drug war. In Tijuana, President Calderon said that California's ballot measure to legalize marijuana represents hypocrisy in US drug policy. "For me, it reflects a terrible inconsistency in government policies in the United States," he said, referring to US demands that Mexico and other countries clamp down on production and trafficking. In Oaxaca, the mayor-elect of a small town was shot and killed . Antonio Jimenez Banos, 47, was due to become the mayor of the small coastal town of Martires de Tacubaya. He was shot in the head and chest as he returned home to his small farm. Eleven sitting mayors have been assassinated in Mexico this year, as well as several candidates and representative-elects. In Ciudad Juarez, 12 people were killed in several incidents. In one incident, two prisoners inside the city’s main prison were killed during a prison riot between the rival Azteca and Mexicles gangs, which work for the Juarez and Sinaloa cartels, respectively. At the same time, another riot occurred in a municipal prison. Soldiers responding to the incident confiscated an unknown quantity of weapons and drugs. 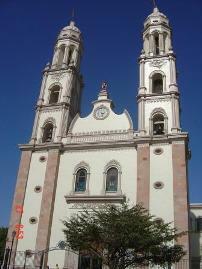 In Ciudad Juarez, six people were killed. In one incident, a group of armed men shot dead three people outside an emergency room hospital. The three men were apparently attempting to flee and hide from the gunmen, but were gunned down just outside the building. In Sinaloa, eight police officers were killed after their convoy was ambushed by gunmen. The officers were patrolling a highway about 50 miles outside of the state capital of Culiacan when they were attacked by a convoy of gunmen traveling in three or four vehicles and wielding automatic weapons. Mexican news sources have reported that three other officers were wounded in the attack. Sinaloa has long been at the heart of Mexico's drug trade. Marijuana and poppy is grown in the area and large-scale meth labs have been known to operate in the area. In Ciudad Juarez, 14 people were killed across the city. The murders occurred despite immensely tight security in the city due to the arrival of President Calderon and a security summit with Mexican governors. According to a Zapata County Sheriff, a Mexican investigator working on the recent Falcoln Lake shooting incident was beheaded. Rolando Flores was a member of the State police based in the city of Miguel Aleman, and was part of the team investigating the shooting of David Hartley, who has been missing since September 30th. Flores' head was reportedly found in a suitcase left outside a Mexican Army installation. Read the previous Mexico Drug War Update here. The campaign to pass California's Proposition 19, the tax and regulate marijuana legalization initiative, is seeing some good-sized late donations, including contributions from Facebook co-founders Dustin Moskovitz and Sean Parker. Meanwhile, Dr. Bronner's Magic Soaps heir David Bronner has kicked in tens of thousands more for a get out the vote effort in the campaign's final weeks. And they're not the only ones making sizeable late donations. Prop 19 would legalize the possession of up to an ounce of pot by adults 21 or older. It would also allow adults to grow up to 25 square feet of marijuana and possess the harvested results. It would give cities and counties the local option to allow, tax, and regulate commercial marijuana sales and cultivation. The initiative holds a four-point lead in the Talking Points Memo Polltracker average of the 13 polls taken on it so far this year. Prop 19 has 47.4% in the poll average to 43.2% against, with less than 10% undecided. Only three of the 13 polls have shown it losing, but with support under 50%, voter turnout and the undecideds will be critical in achieving victory. Moskovitz has now contributed a total of $70,000 to Prop 19, while Parker has given $100,000 to a pro-Prop 19 fund controlled by the Drug Policy Alliance (DPA). David Bronner is giving $75,000 to Students for Sensible Drug Policy (SSDP) for a tour of college campuses designed to energize student turnout, and Washington, DC, activist and entrepreneur Adam Eidinger of Capitol Hemp Clothing and Accessories kicked in another $25,000 for the campus tour. Those aren’t the only big contributions to the cash-strapped campaign, which, despite having raised more than $2.1 million so far, only had $67,000 in the bank as of September 30. But according to late filing reports, in the first few days of this month the campaign got $20,000 from Oakland cannabis entrepreneur Jeff Willcox, a $50,000 donation from Tiburon retiree Stephen Silberstein, $5,000 from Prescription Vending Machines, Inc., and $75,000 from Encino TV producer Kevin Bright. Not counting the Bronner, Eidinger, Parker, and Moskovitz donations, Prop 19 has raised $180,000 so far this month. "More than any other initiative out there, Prop 19 will stabilize our national security and bolster our state economy," said Moskovitz in a statement explaining his support. "It will alleviate unnecessary overcrowding of nonviolent offenders in our state jails, which in turn will help California residents." "These donations mean that these guys get it," said Stephen Gutwillig, DPA California director, referring to the Facebook cofounders. "They are members of a generation that has a consensus that the drug war is a massive failure and will never work. These donors have the means to do something about it. We're really thrilled that they're stepping up in the middle of this crucial campaign that is a bellwether in the struggle to create an exit strategy from this disastrous war on marijuana," he said. "Sean Parker and Dustin Moskovitz are pivotal to this work in this election cycle, and we hope in years to come." DPA will use the money for get out the vote efforts, said Gutwillig. "We'll be focusing on getting young and black and Latino voters to the polls," he explained. "We don't have enough money to mount a TV ad persuasion campaign aimed at undecided voters -- that takes millions of dollars in California. But this is enough money to participate in getting reform-minded voters to the polls, reminding them that Prop 19 is on the ballot and making sure they vote between now and November 2." If the pro-Prop 19 forces don't have the money for a TV ad campaign, they can take some solace in knowing that the opposition doesn't, either -- at least not yet. The main opposition group, Public Safety First, reported only $54,000 in the bank as of September 30. But the Prop 19 forces are waiting for -- not hoping for -- the other shoe to drop. A late, well-funded negative ad campaign in 2008 helped to defeat a sentencing reform initiative that had been leading in the polls up to that point. "I'm calling up businesses like ours that I know are socially and environmentally conscious with a simple message, 'Just Say Now;' now is the time to step up support," said Bronner. "Prop 19 will free up police for fighting real crimes and stop renegade cannabis cultivation by gangs that are destroying our national parks. Cannabis prohibition, not the herb itself, has been ruining productive and upstanding citizens' lives with courts and jails for decades," he said. "I was hoping to trigger more giving with our donation, and the Facebook guys helped, too," said Bronner. "This is just such an important moment; there is so much at stake. It's about being able to promote and get our message across. It's about cannabis, but it's also about freedom," he said. "This has been pretty under-funded," said Bronner. "Richard Lee put in enough money to get on the ballot, and now it comes to getting out the youth vote. SSDP is well-positioned to drive that and already had a game plan. We're just powering that up," he said. 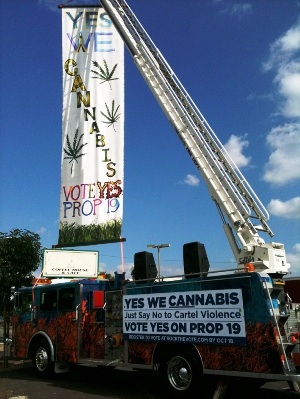 Late last week, Bronner and SSDP announced the "Sound the Alarm to Vote Yes on Prop 19" tour of California college campuses, complete with Dr. Bronner's promotional fire truck, now known as the "Yes We Cannabis Fire Truck." The tour kicked off in San Diego last weekend, and will crisscross the state in the three weeks until Election Day -- this weekend it will be in the Bay Area for SSDP's regional conference in San Francisco. "Young voters are the primary victims of the drug war and logically the largest group of supporters of Prop 19," said SSDP executive director Aaron Houston. "We plan to register thousands of students in the next 10 days and help many first time voters develop plans for Election Day. Meshing good old fashioned one-on-one on college campuses with mobile alert technology sums up our strategy to turn out young voters," he added. SSDP had already planned a get out the vote effort in conjunction with Firedoglake's Just Say Now campaign, but will now expand that effort thanks to the Bronner and Eidinger donations. "We are ramping up our outreach to even more students thanks to the surprise support," Houston said. It's just three weeks from Election Day. The race is tight. The final push is on, the energy level is high, and late donations can help make the difference. Seizing on new independent polling data, proponents of Proposition 19 — the Golden State ballot measure that would make possessing and growing marijuana legal — argue the measure is going to drive younger-voter turnout in such a way that it will benefit the Democrats statewide, from gubernatorial retread Jerry Brown to Sen. Barbara Boxer. SAN DIEGO, CA –Students for Sensible Drug Policy (SSDP),announced plans today to mobilize student voters in support of Proposition 19, the Regulate, Control and Tax Cannabis Act of 2010. SSDP, the nation’s largest student drug policy group with over 150 chapters nationwide, will rally an army of student canvassers at its regional conference to be held at San Francisco State University October 16-17. Many eventshave been scheduled between now and the election on campuses up and down the state. With a massive fire truck touring California, the students will ‘Sound the Alarm to Vote Yes on Prop 19.’ (See schedule below.) Members of the media are invited to tour with the Yes We Cannabis Fire Truck. “Young voters are the primary victims of the drug war and logically the largest group of supporters of Prop 19,” says Aaron Houston, SSDP’s Executive Director. “We plan to register thousands of students in the next 10 days and help many first time voters develop plans for Election Day. Meshing good old fashioned one-on-one on college campuses with mobile alert technology sums up our strategy to turnout young voters,” adds Houston. SSDP already planned a massive canvass in Northern California months ago, but last week the group received a surprise $75,000 dollar donation from David Bronner, President of Dr. Bronner’s Magic Soaps and another $25,000 from Capitol Hemp Clothing and Accessories. “We are ramping up our outreach to even more students thanks to the surprise support,” says Houston. Dr. Bronner’s is providing the company’s promotional fire truck to ‘sound the alarm’ on college campuses across California before November’s election. A California based company, Dr. Bronner’s buys 20 tons of hemp oil for their soaps from Canada each year. For ten years the Bronner family has financially supported bringing back non-drug industrial hemp farming in the US as an environmentally sustainable crop that can be made into a wide variety of products including food, cosmetics, clothing, building materials and much more. Traditionally Dr. Bronner’s has publicly supported ‘hemp only’ advocates; however Mr. Bronner is now publicly calling for the end of cannabis prohibition entirely in light of the bloody conflict being fueled in neighboring Mexico and the enormous waste of California taxpayer and police resources in the current budget crisis. The Regulate, Control and Tax Cannabis Act of 2010, is a California ballot proposition which will be on the November 2, 2010 California statewide ballot. It legalizes various marijuana-related activities, allows local governments to regulate these activities, permits local governments to impose and collect marijuana-related fees and taxes, and authorizes various criminal and civil penalties. In March 2010 it qualified to be on the November statewide ballot. It requires a simple majority in order to pass. Yes on 19 is the official advocacy group for the initiative.SSDP is the lead student organization working with the Yes on 19 campaign. The following is a tentative schedule for the Yes We Cannabis Fire Truck Tour and is subject to change. To confirm exact times of events email Adam Eidinger at [email protected]. Last week we reported on the forces lined up for and against California's Prop 19. A surprising element found in the "against" mix are portions of the cannabis reform community. Some of them are clearly self-interested medical marijuana sellers, and we believe that all of them are thoroughly mistaken or misguided. It's a loud group of people, but one whose actual size and significance is unclear. I did not closely follow the evolution of the "Stoners Against Prop 19," but one event that's said to have given it steam was a video interview by California medical marijuana patient KC Kimber with Dennis Peron, the father of medical marijuana in California and sponsor of the Prop 215 medical marijuana initiative, who regrettably has opposed Prop 19. (I'm having trouble find the video, hence no link.) Kimber discovered later that Peron had fed him a lot of disinformation, and has been campaigning since then for Prop 19's passage. Yesterday he released an interview with cannabis expert and Prop 19 proponent Chris Conrad which debunks Peron's claims. We hope that common sense (perhaps with some help from our reporting) has already made it clear to our readers that Prop 19 is a legalization initiative (albeit the first stage of legalization with more work to be done); that it will help, not hurt, medical marijuana patients (as I've gone into on Huffington Post); and that any compromises it makes are small and necessary ones and that we'll be far better off, now and in the continuing effort, if it passes. We don't want to contribute an exaggerated sense of the importance of the "Stoners Against Prop 19" movement by focusing too much attention on them, but because the vote is likely to be close, and because some of their claims have made it into the mainstream media, we are posting the video here just in case. If you want more information on this subject, we recommend Chris's Prop 19 Fact Check and Rumor Control page. Regarding Peron, we see him as a hero for what he did to bring medical marijuana into being in California, work without which Prop 19 might not even be possible today. We've heard that he's ill, and we wish him well. Prop 19 is too important to hold back on, and so even Dennis Peron cannot be let off the hook when he spreads false information about it, at least not until the election's done. Tensions within California's marijuana community over Proposition 19, the tax and regulate marijuana legalization initiative, boiled over at last weekend's debates between supporters and opponents at the Cow Palace in San Francisco during the International Cannabis and Hemp Expo, a pot industry trade show. The measure has garnered some loud opposition in the marijuana community, though the true extent of the opposition is unclear. Some medical marijuana providers are opposing it, arguing that it endangers the rights of patients, but raising the question of whether what is really being endangered is those providers' profits. [Ed: The proposition contains language which unambiguously protects patients.] Some growers are opposing it, for largely self-interested reasons. And some consumers are opposing it, arguing that it isn't good enough, they might have to pay taxes, and it would lead to the corporatization of cannabis. That has excited a harsh response, not just from the Prop 19 campaign, but also from national marijuana reform organizations. NORML deputy director Paul Armentano likened self-styled Stoners Against Prop 19 to a fringe element and compared their refusal to acknowledge facts with that of the Obama birthers, while NORML outreach director Russ Bellville drafted a line-by-line analysis of the initiative to refute the critics. Cannabis expert and campaign spokesman Chris Conrad has published a Prop 19 Fact Check, and an addendum addressing what he calls Prop 19 conspiracy theories and their authors. Medical marijuana entrepreneur Richard Lee, the primary motivating force behind Prop 19, was subjected to loud heckling and shouting as he attempted to explain why pot people should vote for the initiative, which is holding onto a not-so-comfortable lead in polls heading up to the election now a month away. A disgusted Lee then rolled away in his wheelchair, leaving campaign spokesman and cannabis expert Chris Conrad to carry on.